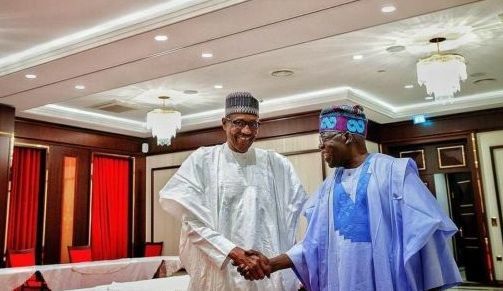 APC national leader, Asiwaju Bola Ahmed Tinubu, yesterday gave a "pass mark" to the Muhammadu Buhari administration in a mid-term assessment of the Federal Government. He reviewed the 3-point focus of the administration – the anti-graft battle, security and re-ordering the economy – saying in spite of strident criticisms, the government had done well to make the country more prosperous now than it was two years ago. But he gave his perspective on how things could be better done. Tinubu spoke during the public presentation of a book “Making steady, sustainable progress for Nigeria’s peace and prosperity” at the old Banquet Hall of the State House in Abuja. He was the special guest of honour at the event. Tinubu said Nigeria must urgently move towards true federalism. He said: “Here, permit me to offer a few observations on how we might proceed. There will be those who might distort what I say here as evidence of ‘space’ between President Buhari and me. Their evidence will be false and their news about this will be fake. Mischief never dies. Fortunately, nor does the truth. “What I proffer today is done in the spirit of utmost respect and affinity by one who wants the best for this government and for Nigeria. I say these things to encourage the government to achieve the greatness the times demand and of which this government is capable. “The battlefront upon which this nation’s fate shall be decided is the economy. On this, almost all else shall hang. In addition to talking about this book which describes our immediate past and present, I want to briefly mention another document: The 2018 budget. “This budget moves us farther in the right direction. It is a bolder, more creative one than this government’s earlier editions. “It shows this government has embraced its progressive identity despite the chorus of opposition. Also that it more clearly realises the depths of the economic and financial challenges before us. “One of the important aspects of this budget is the capital expenditure for needed infrastructure. This investment means the government fully recognises our economy must grow but that it cannot expand beyond the parameters of the infrastructural grid that serves it. “With this book and with the budget we come to the place where past intersects with the present to interact with the future. The place where what we do or don’t do will dictate the Nigeria of tomorrow. He added: “There are three key ideas I would like to table before you today. First, we are among the world’s most populous nations and potentially one of its most powerful. No populous nation has ever attained prosperity without first establishing a robust industrial capacity. “In one form or another, England, America, Japan and China implemented policies to protect key industries, promote employment and encourage exports. “These nations represent the past, present and immediate future of national economic achievement.